Sarah Breen has been appointed Administration Officer for Friends of the Cancer Centre, the charity of Northern Ireland’s centre of excellence in cancer care. Sarah Breen from Newcastle who has a new post with the Friends of the Cancer Centre. Sarah, from Newcastle, was previously in a receptionist/secretary role, funded by Friends of the Cancer Centre, at the Macmillan Support and Information Centre at Belfast City Hospital. The Centre aims to provide support and information to anyone affected by a cancer diagnosis. 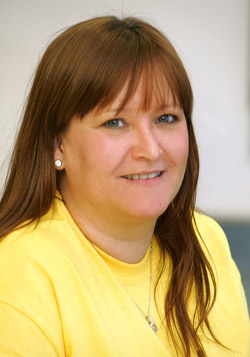 In that role she therefore gained two and a half years experience in supporting people affected by cancer. “It provided me with the initial step to work within cancer support and I feel that this new appointment enables me to give something back to the charity,” said Sarah. In her new job, she will be responsible for providing effective administrative support to the Finance and Projects Manager and assisting with general administration duties regarding income generation.